I was recently interviewed about green living tips for parents by Marianne Wee for TODAY, one of Singapore’s biggest daily newspapers. It’s a terrific feature and I encourage you to check it out online. I was thrilled to be included alongside great eco-friendly brands for kids like my friends Four Cow Farm, Neis Haus and ePloof. As I mention in the article, I started Little Green Dot from necessity – there were very few options for parents trying to raise happy, healthy & green kids in Singapore. I felt a responsibility to highlight those retailers that were helping consumers take small, simple steps to live more green and sustainably. I’m so proud that my tiny list has grown over the years to include over 300 retailers in Singapore, and just look at all the amazing options for parents and kids today! My answers to Marianne’s questions were edited for length in the print article. But as we don’t have any space constraints on Little Green Dot, I thought I would publish my thoughts for you here! Don’t miss my top 5 tips for new parents, as well as 5 eco-unfriendly habits to break in your home. If you find the article useful, please share it with any parents or soon-to-be parents, and let me know your thoughts in the comments. Thanks again to Marianne and TODAY newspaper for asking me to share my perspective. Q: Sustainability is a big driver in the baby products market globally, as a more eco-conscious generation become parents. Do you find that it is a trend that is growing here in Singapore? In the five years since starting Little Green Dot, I’ve seen Singapore’s eco-conscious scene grow and grow! Just last month, I spoke at Green Living [green-living.com.sg], a dedicated eco-lifestyle event that took up a whole floor of the Marina Bay Sands convention centre. In 2011, when I began, this would have been unimaginable! I think that we went through a period where Singapore grew and modernized very quickly and everybody wanted the best and the newest things. But now people are taking a step back and looking at their choices with fresh eyes. I see so many young parents becoming aware of the products that they use around their family – conventional cleaning and skincare products filled with chemicals. They’re looking for healthier options for their children and themselves. But at the same time, I see grandparents becoming more interested in reconnecting with their heritage and getting back to a simpler, greener lifestyle. I believe that this is a national shift in awareness and it’s going to continue to grow. Q: Why did you make the decision to start your eco-friendly website and how is it doing? I started Little Green Dot out of my own personal experience. I had one young daughter and was pregnant with my second. I wanted to live a more natural lifestyle, but I couldn’t a resource in Singapore that spoke about my experience – striving to live more healthy and green in a busy, urban city. Little Green Dot started as a small list of natural and eco-friendly retailers that I had found and wanted to share, as well as some simple tips. But it grew quickly! People are always amazed to hear that everything I learned about living green, I learned right here in Singapore! It has to be accessible, simple and inspiring – and that’s exactly what I share. 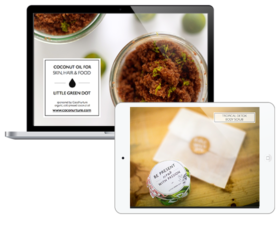 Now, over 150,000 readers come to Little Green Dot every month to get inspired and take action – we share beautiful and simple recipes for natural beauty, delicious meals, and activities with the family. The eco-friendly shopping directory has grown to over 300 green stores and restaurants in Singapore. It’s a very exciting time! Q: A lot of baby products tend to get outgrown quickly and parents in developed cities like Singapore tend to over-purchase or buy unnecessary stuff. What do you think can be done to minimise this wastage? It can be fun and exciting to buy new things, but it quickly turns into clutter which only makes you feel overwhelmed in your own home. When you make that mental connection, you become much more selective about what you allow into your home. It’s not only our own purchases – it’s also well-meaning gifts that we simply don’t need and often don’t end up using. This is especially true with for our little ones — people understandably love giving them gifts. I tell our family and friends that instead of gifting clothing and toys which can pile up – to instead give a gift of an experience: a day out in a museum, a fun afternoon lunch, or a playdate. Children love attention, and spending time with them is more meaningful. My in-laws are great at this. When they come to visit, instead of bringing toys – they will book a show at the theatre and the girls love it! Q: What are your top 5 tips on how first-time parents can avoid wastage when buying items for a new baby? It’s so hard to tell a first-time parent not to buy all the extras – clothes and bottles and toys and gadget! But the truth is in the first three months – you really don’t need very much at all! I promise you’ll learn so much in that conversation and avoid wasted purchases! When we were pregnant with our first daughter, we bought a $200 baby monitor because we thought it was something that all parents are supposed to have. But for the first year she slept right by our bed, and when she did go into her own room – our place was so small we could hear everything! We never even took the monitor out of its box! Don’t buy what you think you’ll need one day – notice and observe your needs and shop accordingly. Create a clear vision in your mind of how you’d love your home to look and feel. You might even write it down, collect images that inspire you and keep it on your phone so you can look at it. And any time you are out shopping – stay focused on that vision. Anything that doesn’t fit – doesn’t come in! If you go out shopping on impulse, buying random things as you see them – you’ll notice that it creates a disconnect between how you’d love your home to look and feel – and how it actually does. My children have both attended Montessori schools and I learned a technique that I use in my home still today. Instead of having a mass of toys in one place – create individual baskets, with only one type of toy in each. One basket might have wooden blocks, another basket with a set of pretend food… whatever is appropriate for their age. It’s an amazing tip to cut down clutter and chaos. Our children get overwhelmed by clutter too. This system gives your child time and space to fully explore and enjoy one toy, before moving on to the next. When they get bored, they can put away the pieces back into its basket and pull out another one to play with. When you notice that your child outgrows a certain type of toy, you can gift it – and then replace something new in that basket. Check out websites like Carousell [carousell.com] where you can find second-hand items. Children outgrow things so quickly that if you can avoid buying new – it will make a huge difference. Not just in waste, but in your wallet too! Q: What are the top 5 eco-unfriendly practices that parents should stop doing? And what are the alternatives? People use chemical cleaners and anti-bacterials because they think it will keep their home and family healthy – but these products do not belong in a family home. They can be doing more harm than good! If you smell it and it’s harsh to the nose – it’s far too toxic! There are wonderful local brands that you can turn to – like IDOCARE – that make a range of non-toxic homecare products. But remember, so much of what you use to clean your home, you can actually make yourself very simply. 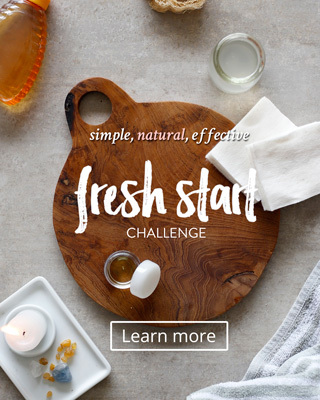 I have a free green cleaning guide on my website that uses only common household ingredients to replace dozens of conventional cleaners – check it out at littlegreendot.com. Your baby’s skin is so delicate, their system is just growing – we don’t want to bombard them with chemicals from skincare products. Simple and natural is always best. It’s shocking what goes into some of the products that are designed for babies. Fragrances that cause inflammation and allergies. Preservatives that interfere with their hormones. I can’t understand why they’re allowed to sell it, but you don’t need to buy it. Again, look for great local brands like Four Cow Farm that make non-toxic skincare for your baby. Remember, you don’t need to go out and buy expensive organic products – we can make very simple and effective skincare products at home! I love sharing these recipes with my Little Green Dot readers! Learning how to manage a home kitchen and feed your family efficiently is a very valuable skill. Take time to notice the waste, think about your buying habits and what gets thrown out, unused or ends up spoiling so that you can get curious about how to resolve this in your home. You might learn how to use your freezer more efficiently, how to preserve your herbs and leafy greens and how to plan your meals for the week ahead. And as you learn more about natural cleaners and skincare products, you’ll find that food that might normally go to waste can be used in all sorts of creative ways in your home. We tend to spend a lot of our time indoors, we even take our children to indoor playgrounds – but developing a relationship with nature is like any relationship. We need to spend time with nature, nurture the relationship and create a future generation that loves and respects our planet. Let your children play in the grass, get dirty, pick up insects and jump in puddles. Let them feel that connection that we have to living things around us, let them dig in the dirt for worms, plant a garden and feel grateful for everything that nature provides us. To live green, you don’t need to turn your life upside down and give up all the conveniences that you love. People often think it’s a burden or a chore… but there is nothing more gratifying and fulfilling or inspiring than living the life that you envision for yourself. if you love the idea of creating a home that is intentional and peaceful, if you want a life that is connected and meaningful if you want to be a positive part of this world – small steps will get you there. Everyday say to yourself, what’s one thing I can do to live more happy, healthy and green? Q: What would you say to parents to convince them that they need to embrace a greener lifestyle, especially for their kids? We live in an amazing city in an amazing world. But the problems that we’re facing – from water and energy shortages to climate change – won’t get fixed overnight. So it’s important to put your effort into your children and raising caring kids. We need to create a generation of people with the skills and the determination to solve the big problems that the world faces. Remember, being green isn’t about spending more and more on natural and organic products. It’s about being conscious of the choices that we make every day and taking small steps to make things better. Something as simple as spending time with your children in nature doesn’t cost a cent, but will pay dividends for years to come.